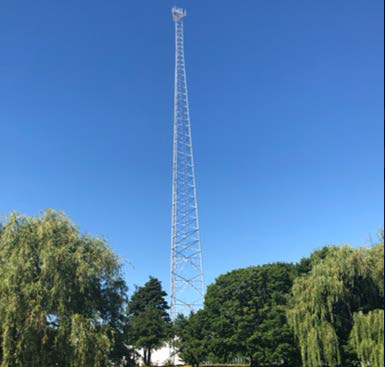 CyrusOne has completed construction of a 350 foot-tall communications tower at its data center campus in a Chicago suburb, home to the computing infrastructure of CME Group, operator of some of the world’s largest futures exchanges. CyrusOne is offering high-frequency traders colocation space for antennas on the tower. By placing an antenna there, a trader can get as close to the CME servers as possible, shaving microseconds off the time it can transfer CME data to the trading hubs in New Jersey, London, Frankfurt, or elsewhere. The service is aimed at companies that compete by designing computer algorithms’ that can make split-second trading decisions based on market events in near-real time. Every microsecond counts in that environment. Traders and companies providing infrastructure services to them have been battling for real estate around the Aurora, Illinois, data center campus since at least last year to install antennas in proximity to CME. In one example, an affiliate of the trading firm Jump Trading bought a 31-acre plot across the street from the facility for $14 million, double the going rate at the time, Bloomberg News reported in May 2017. Other players that have sought to get wireless communications equipment close to the site include McKay Brothers, Webline Holdings, IMC BV, and Scientel. Earlier this year, CyrusOne sued local officials for granting Scientel permission to build a tower that would compete with its tower, alleging that they had violated federal laws, city zoning ordinances, and due-process protocol, Crain’s Chicago Business reported. The communications tower on CyrusOne's Aurora, Illinois, data center campus, home to the computing infrastructure of CME Group. CME sold its Aurora data center to CyrusOne in 2016 for $130 million, leasing back the space for its infrastructure from the Dallas-based specialist data center provider. CyrusOne has since built another data center on the property. While the tower isn’t expected to be a game-changer for CyrusOne, the data center operator did acknowledge its significance to the traders it expects to use it and the importance of ensuring a level playing field.